For sixteen years or so, I celebrated my birthday each year with a tea party. The tradition started when I was a junior in college, living in Edinburgh, Scotland. The heydays were when we all jammed into my tiny apartment in Manhattan’s Upper East Side. Last year’s celebration was held at Tea & Sympathy in NYC with dear, dear friends. A great time was had by all. This year, intuition suggested a blizzard might hamper the proceedings (when your birthday is in February, you develop an awareness of dramatic weather doings), so I postponed the cucumber sandwiches (and celebrated early, with a friend). 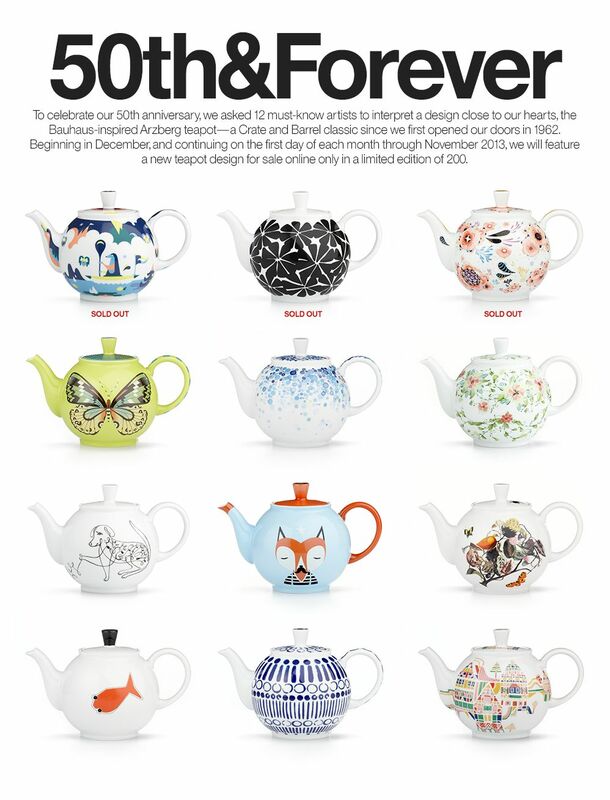 But I still have tea party on the mind, and so it delighted me to see Crate & Barrel jump on my tea party bus, celebrating its 50th anniversary with a selection of teapots featuring custom designs by noted artists.